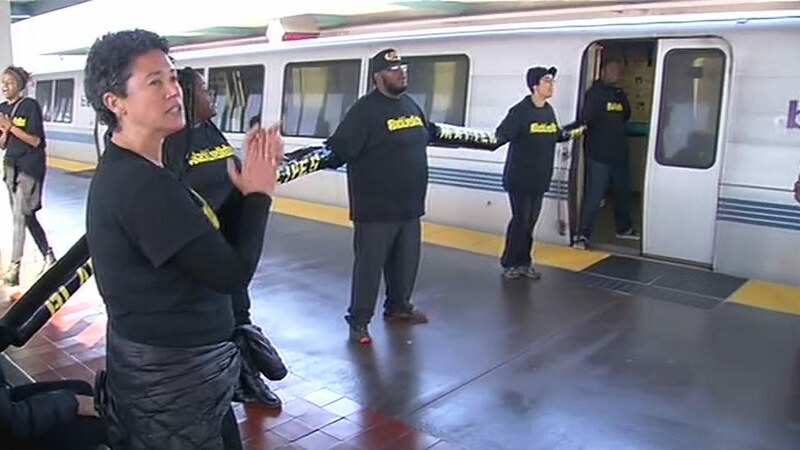 OAKLAND, Calif. (KGO) -- The Alameda County District Attorney's Office announced Friday that it is dropping charges against 14 Black Lives Matter protesters who chained themselves to BART trains in West Oakland last year. The misdemeanor charges stemmed from a demonstration on Nov. 28, 2014, which was linked to a protest campaign that swept the country after the shooting of 18-year-old Michael Brown by Ferguson, Missouri, police Officer Darren Wilson. The protesters chained themselves to each other and to two BART trains at the West Oakland BART station, which halted service through the Transbay Tube to San Francisco for more than an hour. Since the protesters were arrested and charged in court, the matter has been litigated and the courts have denied defense motions for dismissal, according to District Attorney Nancy E. O'Malley. Friday, the district attorney's office is no longer seeking criminal convictions. O'Malley said that this follows the completion of a restorative justice process, which aimed to facilitate rehabilitation and reconciliation. A statement released by the protesters today said that O'Malley "has listened to thousands of local voices, reviewed the facts and thoughtfully chosen to end the prosecution of black activists protesting for their right to live." Eva Paterson, a prominent civil rights attorney and the president of the Equal Justice Society, mediated the restorative justice process. "Through this process, the parties were able to have an open and honest dialogue, listening to and understanding each other's concerns and perspectives," Paterson said in a statement. "I believe that important concepts were clearly stated and agreed upon and that all parties will go forward with a deeper understanding of their roles and responsibilities within the community," she added. The protesters acknowledged the 2014 protest "conveyed an important message," but said the method used "impacted the Bay Area and was a violation of that statue governing the safe and efficient operation of public transportation." Black Lives Matter demonstrators in downtown Oakland on Nov. 23 made calls for the drop of these charges against the group, known as the "Black Friday 14." "We are beyond appreciative of the community support and people who came out in droves, planned solidarity actions and invited us to their events to speak; the people who stood strong to demand that the charges against us be dropped," Cat Brooks, one of the protesters, said in a statement.